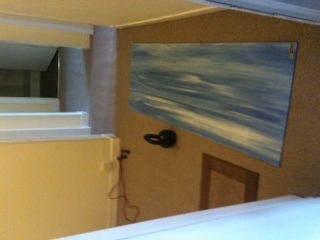 Sunday morning…and I wasn’t sure if I could be bothered doing the 45 minute kettlebell workout… just laziness really. But I thought 45 minutes isn’t all that long and I’ll feel good after it (although it will be hard when I do it). Kettlebell circuit: 45 mins, 10 exercises, 6 repeats, 30:15 work:rest. It started to get hard after about 20 mins, but I managed to keep up the energy levels I think. I found the mountain climbers hard, but I think they’ll be a good one for building up my legs (the top of them felt sore 22 miles into the marathon in November). And maybe step ups and single leg jumps would be good too. Kettlebell circuit: 45 mins, Ave HR: 133 (70%), Max HR: 156 (82%), Calories: 467. This entry was posted in Circuits, Tabata and tagged 30:15, 45 mins, circuits, home workout, kettlebell, tabata, work:rest. Bookmark the permalink.